Most people over the age of 20 will remember the ViewMaster toys that let you see slideshows from your favorite movies and cartoons in 3D. Shabby, static 3D, but still. Well, Hasbro has put out a product that, while it sounds ridiculous at first, is actually sheer genius. Replace the slide wheels with an iPhone! It’s brilliant! What you do is download an app and some content, then attach the iPhone to the end of the viewer goggle-thing by means of a special bracket (there’s one for every iPhone or iPod touch model). It sits securely in there and shows the two stereo images, which the goggles make into one awesome, totally self-contained 3D content. Add headphones and your kids will do this for days. Right now there are no brand names, and the programs (Shark Simulator, Santa Monica Pier Simulator, Starfish Simulator) might not actually be enough to hold a kid’s attention for more than 15 or 20 minutes, but hey, it’s just the launch titles. The idea is solid as hell. And it only costs $35! More for the apps, of course, but hey! It’ll be available at Target on April 3rd, and you’ll probably be able to order it online shortly after. There should be more info at My3DNow.com when that goes up. Introduces you to the exciting world of MY3D, showcasing 3D movie trailers, cool video demos of additional my3D apps, slide shows and more. 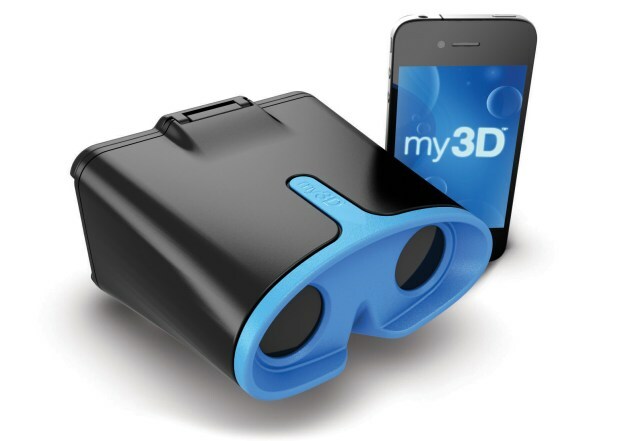 MY3D PRESENTS… is updated regularly on your device as new content is available for you to sample. Explore and hunt the living ocean through the eyes of a shark! MY3D 360° SHARKS immerses you in an underwater shark adventure. Choose your shark and then roam underwater, exploring and hunting for new species of prey. As you explore, search for treasure, shipwrecks and other surprises, and learn about the species around you. You can even break the surface to see the upper world. With six unique environments, there is always a new adventure around the next reef. Welcome to MY3D SECTOR 17, a one-of-a-kind 3D, 360 degree shooter game in which you are the galaxy’s last defense. Assume your role at the gunner station, select from an arsenal of weapons, and stop all enemies as they approach. Move fast because danger comes from above, below, and behind you. Watch out for asteroids! With 22 incredible 3D levels including an “endless” survivor mode, cool bosses, upgrades, and multiple weapons, it’s time for you to dominate the battle. With my3D Teleport L.A. you can explore exciting Los Angeles attractions anytime and anywhere…like you’re really there! This unique 360°, 3D interactive virtual tour allows you to experience L.A. from the Santa Monica Pier. You can simply explore or play fun interactive games. You’ll love your visit to Los Angeles! Welcome to the wacky world of MY3D BUBBLE BOLT! Become a Fish, Shark, or Starfish and navigate your way past obstacles by tilting and moving your viewer. This frenzied puzzle game is easy to learn, highly addictive and provides endless fun with 25 3D levels. Watch out and don’t fall off the edge, or your bubble will drop into the sea! The next generation of racing takes place in 3D tunnels underground. This futuristic game allows you to compete against other hover vehicles by tilting and turning your MY3D viewer. Use your cache of weapons to battle for supremacy in land, sea, and air. But, you will need quick reflexes to avoid steel door traps, and enemy racers on 12 unique racetracks. Choose from one of six racers. Do you have what it takes to be the best in this 3D reflex-testing racing game? Defend the galaxy from the invasion of the drones. As humanity’s last hope in this futuristic pilot shooter, you’ll need fast reflexes and an even faster trigger finger to save the galaxy from dangerous enemies with a deadly array of attacks. Rack up points by destroying enemies quickly in succession and earning multipliers. Compete for the top spot on the high score list as you play 60 challenging levels that transform as you progress.